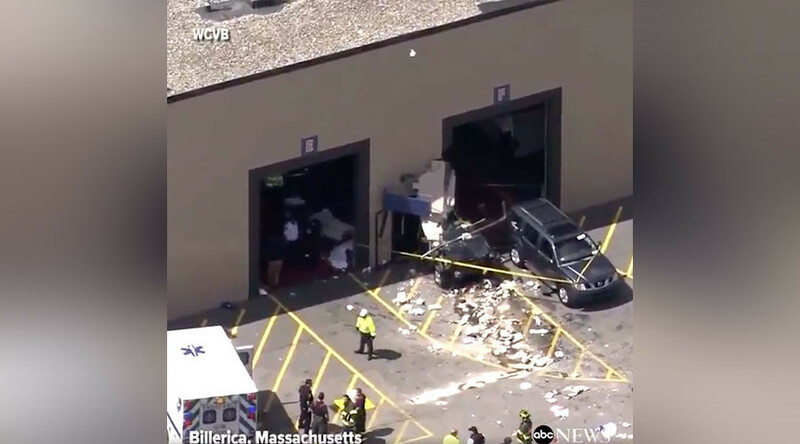 At least three people were killed and multiple others injured when an SUV drove through a crowd and slammed into a wall at a North Billerica auto auction in Massachusetts. "The preliminary investigation at the scene of the crash at Lynnway Auto Auctions in Billerica indicates that there are fatalities among the multiple victims," state police said in a statement. Middlesex District Attorney Marian Ryan says the dead were one man and two women. She says two of the nine who were taken to hospitals suffered life-threatening injuries. "It was a tragic accident," said Ryan. She said the driver, who worked at the auction, is not hospitalized but victims have head and back injuries. Auction attendee Geraldo Lima told the Boston Herald that about an estimated 2,000 people were inside the auction when a blue Jeep Cherokee zipped about three feet from him, mowing down people for about 80 yards before slamming into a concrete wall with such force it cracked it. Lima said the driver appeared to be an elderly man. "I saw the Jeep Cherokee driving through people," he said. "I was right next to the car – I jumped away." "I heard a lot of people screaming, yelling and then running from the accident. There was a lot of blood. ... It was so fast," Lima said. Witnesses compared it to a “war zone.” Images from TV helicopters showed a vehicle covered in debris that appeared to have crashed through an exterior wall from inside the building. A witness told WCVB-TV that cars were lined up on the auction block when one vehicle suddenly accelerated. Several ambulances were on the scene, and medics wheeled people out of the building on gurneys. Lahey Hospital and Medical Center says it is treating six injured people, and Lowell General Hospital says it has three others.